For more than a century U.S. foreign policywhether conducted by Democrats or Republicans, liberals or conservativeshas been based on the assumption that Americans interests are served best by intervening abroad to secure open markets for U.S. exports, fight potential enemies far from American shores, or engage in democratic nation building. Before the twentieth century, however, a foreign policy of nonintervention was widely considered more desirable, and Washingtons and Jeffersons advice that the republic avoid foreign entanglements was largely heeded. Opposing the Crusader State: Alternatives to Global Interventionism, edited by Robert Higgs and Carl Close, examines the history of American noninterventionism and its relevance in todays world. Arguing that interventionism is not an appropriate default setting for U.S. foreign policy, the books contributors clarify widespread misunderstandings about noninterventionism, question the wisdom of nation building, debate the validity of democratic-peace theory, and make the case for pursuing a peace strategy based on private-property rights and free trade. 6. Does Nation Building Work? 7. Did The United States Create Democracy in Germany? For more than a century U.S. foreign policy, whether conducted by Democrats or Republicans, liberals or conservatives, has been based on the assumption that Americans interests are served best by intervening abroad to secure open markets for U.S. exports, fight potential enemies far from American shores, or engage in democratic nation building. Before the 20th century, however, a foreign policy of nonintervention was widely considered more desirable, and Washingtons and Jeffersons advice that the republic avoid foreign entanglements was largely heeded. 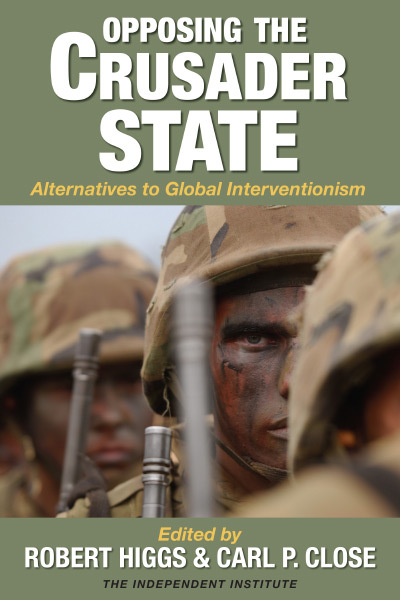 Opposing the Crusader State: Alternatives to Global Interventionism, edited by Robert Higgs and Carl P. Close, examines the history of American noninterventionism and its relevance in todays world. Arguing that intervention is not an appropriate default setting for U.S. foreign policy, the books contributors clarify widespread misunderstandings about noninterventionism, question the wisdom of nation building, debate the validity of democratic-peace theory, and make the case for pursuing a peace strategy that emphasizes private-property rights and free trade. American noninterventionists have often argued that meddling in the affairs of other countries and committing U.S. troops overseas runs counter to the republics founding principles and weakens economic and civil liberties at home. Joseph R. Stromberg develops this theme in chapter 2, Imperialism, Noninterventionism, and Revolution: Opponents of the Modern American Empire. Despite such deviations as James Madisons theory of territorial expansion and the Monroe Doctrine, a noninterventionist foreign policy largely prevailed until the Spanish- American War. William Graham Sumner and other classical liberals predicted that the U.S. military occupation of Spains former possessions would erode republican government and weaken individual liberty at home. Michael T. Hayes examines the ideas of one of the leading noninterventionists in American politics in chapter 4, The Republican Road Not Taken: The Foreign-Policy Vision of Robert A. Taft. Pursuing regime stability abroad, as Truman and Eisenhower did, Taft argued, exposed Americans to a backlash of resentment from people suffering under the yoke of harsh U.S.-backed governments. Many analysts argue that several economic and social conditions must first be met before liberal democracy can take root, but they often neglect the fundamental prerequisite: political elites, and the culture at large, must eschew political violence, argues James L. Payne in chapter 5, The Prospects for Democracy in High-Violence Societies. This neglected truth sheds light on the poor results of efforts to export democracy. Payne examines the lackluster record of U.S. and British attempts to engage in democratic nation building since the mid-19th century in chapter 6, Does Nation Building Work? Politicians and pundits have often cited West Germany as a success story of American nation building, but Payne argues against this claim in chapter 7, Did the United States Create Democracy in Germany? It should not be surprising that U.S. policy during the occupation of 1945 to 1952 did not promote democracy, because the policy did not seek to promote a democratic political culture, but rather to eliminate Germanys war-making potential, de-Nazify German society, and penalize ordinary Germans. Some analysts argue that democracies rarely, if ever, go to war with each other because democracies are inherently much less warlike with each other. If the theory of democratic peace is correct, it buttresses the case for democratic nation building. How valid and robust is the theory? This question is contentious even among classical liberals, as this section of the book demonstrates. In chapter 9, Democracy and War, Ted Galen Carpenter criticizes the version of democratic-peace theory found in R. J. Rummels 1997 book Power Kills: Democracy as a Method of Nonviolence, a synthesis of decades of empirical research by Rummel and other democratic-peace theorists. According to Carpenter, Rummel minimizes or ignores alternative explanations for the peace observed among democracies and discounts cases that cast doubt on the peaceful democracies thesis. R. J. Rummel responds in chapter 10, Democracy and War: Reply, arguing that Carpenters alleged counterexamples to democratic-peace theory are not valid counterexamples. Rummel also claims he has tested and ruled out more alternative explanations for the democratic peace than Carpenter had proposed. Finally, in chapter 11, Democracy and War: Rejoinder, Carpenter challenges the validity of Rummels designation of which countries are truly democratic, arguing that Rummels distinction between hot and cold wars enables him to downplay democracies many proxy wars, covert operations, and close calls with open warfare. Some advocates of market economies passionately support a large military, whereas many who oppose a large military also oppose free markets. These two camps, however, are not the only alternatives. Historically, classical liberals were both supporters of free markets and critics of military adventurism. British parliamentarian and writer Richard Cobden (180465), for example, held that more military entails less market, explains Edward P. Stringham in chapter 13, Commerce, Markets, and Peace: Richard Cobdens Enduring Lessons. Productive British citizens did not benefit from military interventionism, according to Cobden, because it required levels of taxation that hampered the civilian economy. Cobdens viewsprosperity requires peace; peace is more secure when countries have strong trade ties; and liberty is spread more effectively by education and persuasion than by intimidation and coercionare as relevant today as in his day. Although the economic benefits of trade are widely understood, the international security benefits are not, despite many studies firmly establishing that trade promotes peace. If these studies were better known, many critics of globalization might become supporters. Erich Weede discusses the literature supporting the peace by trade claim in chapter 14, The Diffusion of Prosperity and Peace by Globalization. Weede cautions that the trade-peace link may not prevent wars every time, especially if a country has weak property rights and democratic institutions. Nevertheless, the trade-peace link is very strong. Trade between China and Taiwan, for example, seems to have pacified what otherwise might be an extremely hostile relationship. The policy implications of the capitalist-peace strategy are simple: promote economic freedom and globalization, writes Weede. If the policy succeeds, one gets more prosperity, more democracy, less civil war, and less interstate war. The political challenges of implementing this approach are daunting, especially in poor and conflictridden countries, Weede notes, but it is more likely to be adopted if Western countries practice it consistently and thus become models for others to emulate. Robert Higgs is Senior Fellow in Political Economy for the Independent Institute and editor of The Independent Review. He received his Ph.D. in economics from the Johns Hopkins University, and he has been a member of the faculty at the University of Washington, Lafayette College, and Seattle University, and a visiting professor at the University of Economics in Prague. He is the author of eight books, the most recent of which are Depression, War, and Cold War and Neither Liberty nor Safety, and the editor or co-editor of five books. A contributor to many scholarly volumes, he is also the author of more than 100 articles and reviews in the professional journals of economics, demography, history, and public policy and the author of many articles in the popular press. He was named to the Templeton Foundations Honor Roll for Colleges and Universities in 1989. He received the Distinguished Scholar Award from the Association of Private Enterprise Education in 1993; the Friedrich von Wieser Memorial Prize for Excellence in Economic Education from the Prague Conference on Political Economy in 2006; the Thomas S. Szasz Award for Outstanding Contributions to the Cause of Civil Liberties from the Center for Independent Thought in 2006; and the Gary G. Schlarbaum Prize for Lifetime Achievement in Liberty from the Ludwig von Mises Institute in 2007. Carl P. Close is Research Fellow and Academic Affairs Director at the Independent Institute and Assistant Editor of The Independent Review. He is co-editor (with Robert Higgs) of The Challenge of Liberty (2006) and Re-Thinking Green (2005). His research interests include environmental policy, the history of economic and political thought, and the political economy of propaganda. He received his masters degree in economics from the University of California, Santa Barbara.